Back to Home Page 12/05/01 rev 02/18/03 SE/30 WITH IIsi or IIfx ROM Thanks to Vintage Box : 68k Mac - OS 8/030 for the OS 8 & 8.1 hacks. Following are methods for installing OS 7.0.1, 7.1, 7.5.3, 7.5.5, 7.6.1, 8.0, or 8.1 on an SE/30 with a IIsi or IIfx ROM SIMM. With these ROM SIMMs Mode 32 is not required and should not be installed. Minimum hardware requirements: 16 MB RAM, 44 MB free space on hard drive. We have not encountered any problems with variations in SE/30 logic boards. ROM SIMM information is included. Compatibility with boot disks has been tested. Two screenshots are included. Field Report. 'Customize: System Software for any Macintosh'. Hard drive to have OS 7.0.1 or 7.1. Also 7.5.3 Installer, System Picker 1.1a3, ResEdit 2.1.3, and Mode32 v7.5 Installer. Turn off SE/30 and install IIsi or IIfx ROM SIMM. Boot from hard drive OS 7.0.1 or 7.1 and open Mode32 v7.5 Installer. Remove Mode 32 v7.5. In Memory control panel set '32-bit Addressing' to 'On'. Close Memory control panel and reboot. Launch the 7.5.3 Installer with Installer options "Clean Install" (COMMAND SHIFT k) and "Easy Install".  'gusd' resource 'ID 1' at offset '000018', replace data '0008 0003 0009 0003' with data '0008 0003 0009 0005'. Use System Picker to select hard drive OS 7.5.3 for reboot. Hard drive to have OS 7.5.3, installed per above. Also 7.5.5 Update Installer, System Picker 1.1a3, ResEdit 2.1.3, and Disk Copy 6.3.3. Boot from hard drive OS 7.5.3. Mount the OS 7.5.5 disk images on the desktop. Launch the 7.5.5 Update Installer. After Installer is done, restart with 7.0.1 Disk Tools floppy and do. Use System Picker to select hard drive OS 7.5.5 for reboot. NOTE: 7.6.1 Update will be installed on top of 7.6 without trying to boot from 7.6. CD ROM drive or hard drive to have OS 7.6 installer. Hard drive to have OS 7.0.1 or 7.1, 7.6.1 Update Installer, ResEdit 2.1.3, and Disk Copy 6.3.3.  Trash Apple HD SC Setup.  Add Wish I Were and CD-Sunrise v2.2c extensions to Extensions folder.  Add Wish I Were control panel to Control Panels folder.  Add System_Picker 1.1a3 application. Boot from modified 7.0.1 Disk Tools floppy, set Wish I Were control panel to 'Macintosh IIsi', close control panel, and reboot with modified 7.0.1 Disk Tools floppy. Launch the 7.6 Installer with Installer options "Clean Install" and "Easy Install". After the 7.6 Installer is done Trash any mounted 7.6 Installer images from desktop. with data '0008 0003 0009 0005'. Use System Picker to select hard drive OS 7.6.1 for reboot. Hard drive to have OS 7.0.1 or 7.1, System Picker 1.1a3, ResEdit 2.1.3, Wish I Were, Mode32 v7.5 Installer, and os8-030patch folder. CD ROM drive to have OS 8.0 or OS 8.1 CD. In Memory control panel set '32-bit Addressing' to 'On'. Close Memory control panel. Drag Wish I Were control panel and Wish I Were extension to hard drive 7.0.1 or 7.1 System Folder icon. Set Wish I Were control panel to 'Quadra 700', close control panel, then reboot. Full Install Pieces-->Software Installers-->System Software-->Mac OS 8-->. Launch the 8.0 Installer with Installer options "Clean Install" and "Easy Install".  Replace 'boot' resource 'ID 2' with the same resource from 'os8-030patch.rsrc'.  Replace 'gbly' resource 'ID -16385' with the same resource from 'os8-030patch.rsrc'.  'gusd' resource 'ID 1' at offset '000010', replace data '0016 0006' with data '0009 0005'. Trash the 'Monitors and Sound' control panel. From the Apple Extras folder drag both the 'Monitors' and 'Sound' control panels to the System Folder icon. Use System Picker to select hard drive OS 8.0 for reboot. Hard drive to have OS 8.0, installed per above, and OS 8.1 Update installer, Disk Copy 6.3.3, System Picker 1.1a3, ResEdit 2.1.3, Wish I Were, and os8-030patch folder. Boot from hard drive OS 8.0. Drag Wish I Were control panel and Wish I Were extension to OS 8.0 System folder icon. Set Extensions Manager to 'My Settings', check all boxes. Set Wish I Were control panel to 'Quadra 700', close control panel, then reboot. Open Mac OS 8.1 Update installer, in Options uncheck 'Update Apple Hard Drive Drivers'. Run Mac OS 8.1 Update installer.  'gusd' resource 'ID 1' at offset '000010', replace data '0016 0006' with data '0009 0006'. Use System Picker to select hard drive OS 8.1 for reboot. Both worked OK with no hacks. 'gusd' resource 'ID 1' at offset '000018', replace data '0008 0003 0009 0003' with data '0008 0003 0009 0005'. We were unable to get this disk to work. Mode32 v7.5 Installer..For removing Mode32 version 7.5. 7.0.1 Disk Tools......For installing OS 7.5.3 and higher. CD-Sunrise v2.2c......Universal CD-ROM driver extension. Wish I Were 2.0.......Control Panel and Extension, for installing 7.6.1, 8.0, or 8.1. System_Picker 1.1a3..For selecting the boot OS. OS8-030 Patch.........For patching OS 8 & 8.1. ResEdit 2.1.3..........For editing System files. Disk Copy 6.3.3.......For mounting Installer Disk Images. TattleTech 2.58.........For identifying ROM SIMM. ROM Checksums......For identifying ROM SIMM. 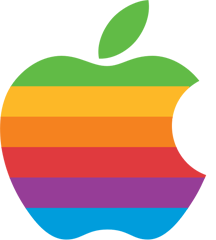 List of Gestalt codes for Macintosh Computers...For installing 8.0 & 8.1 on other 68030 Macs. Macintosh Computers: ROM Version Numbers. Macintosh: ROM Size for Various Models. Formatted with Apple HD SC Setup 7.3.5. Born Again, from Brochner Software, is software that permits installing OS 8 or 8.1 on 68030 Macs with 32 bit clean ROMS. We in no way used Born Again to install OS 8 or OS 8.1 on the SE/30. We never looked at any code from Born Again. We got the trial version from the author and tried it once to unsuccessfully install OS 8.1 on an SE/30 with IIsi ROM SIMM.